eForms comes preconfigured with the rates and constants set by legislation for 2018. 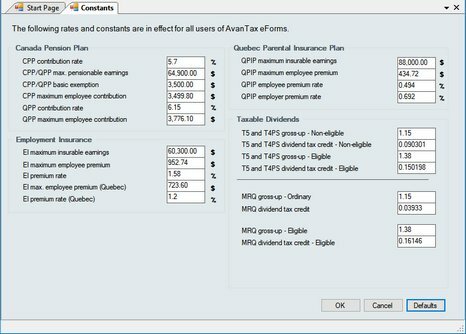 Using this utility the rates and constants as required to enable preparation of returns using 2019 rates and constants when eForms 2019 is not yet available (ie: To submit returns after a business closing midway through 2019). Click the Defaults button to return all rates and constants to their 2018 legislated values.